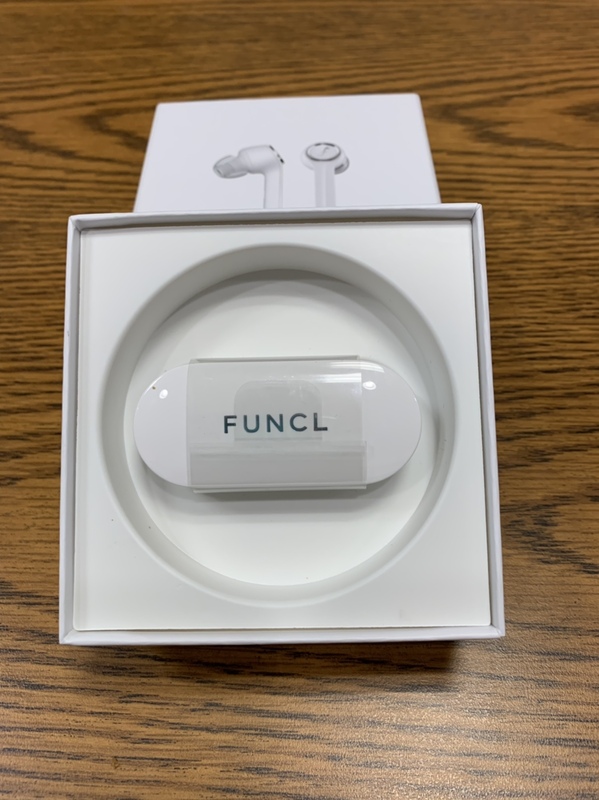 The folks at Funcl sent me Funcl AI earphones to review as part of the Mobile Nations Community Review Team. To be honest, I was very excited about a pair of truly wireless earphones with great sound and battery life, all for just $54! Does the Funcl AI live up to the hype? Read more to find out! Please beware that I received a testing unit from the first batch of the production pilot run, so some of the issues mentioned in this review may be addressed in the actual production product. I tested these earphones on my Samsung Galaxy S9 Plus, Apple iPhone XS Max, and Apple iPad Pro 12.9 (2nd Gen). The earphones came nicely packaged in a cardboard box, similar to what Apple uses to package their AirPods. The microUSB cable and ear cushions (3 different sizes) are located under the plastic piece holding the earphones and charger. It was a little counterintuitive as there was no tab to indicate that there were accessories underneath. Physically, the earphones seem well constructed. Even though they are made of plastic, they didn’t feel cheap. Each earphone has a capacitive button which is used in lieu of physical buttons. 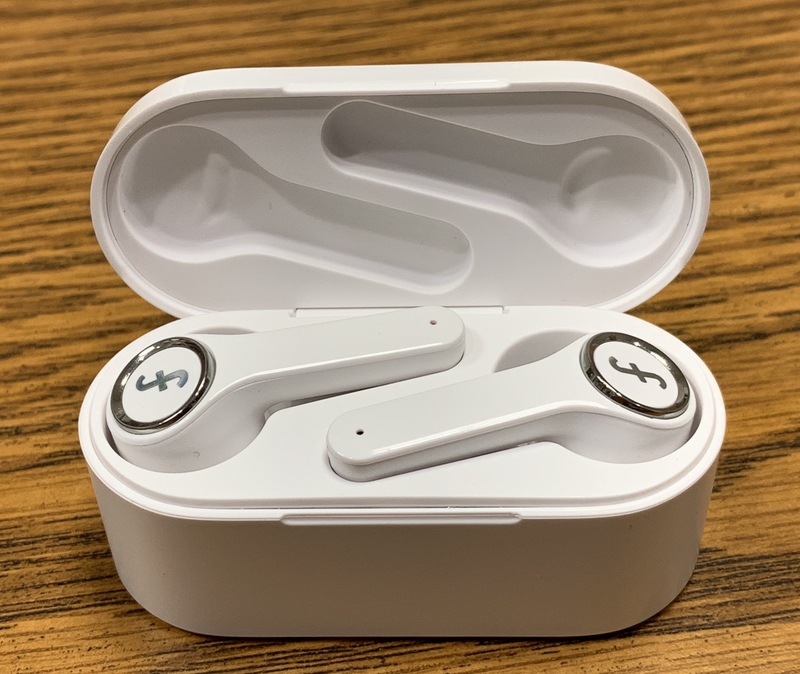 The case connects with the included micro USB cable, and has a built-in battery, so the case does not have to be plugged in to charge the earphones. The earphones will blink red when charging, and the light will disappear once charging is complete. Charging takes about an hour. I used the largest ear cushions and they fit snug in my ear. I have worn them for several hours, and they also felt comfortable and, very lightweight. I can barely feel them there. Funcl rates the AI at 24-hour battery life. I believe that that includes 3 charges from the charging dock, since I am getting about 6 hours battery life after my first charge. The battery meter seems off in the Funcl app since it still shows 100% even after 2 hours of usage. The earphones will automatically enter pairing mode (indicator light on earphones will flash white) when you remove them for the first time from the charging dock. You can touch the left button for 2 seconds while the earphones are turned on to enter pairing mode as well. Press the button on both the left and right earphones for 2 seconds to turn them on. Or you can just press the button on one of them to use it as a single earphone. Note that you will have to pair the right earphone separately if you wish to use it as a single earphone. The earphones will provide a connection chime when it connects to a device. You can turn off the earphones by pressing the button on left earphone for 3 seconds. I have accidentally entered pairing mode (which is a 2 second press) a few times when trying to power down the earphones, so now I make sure to hear the power down chime before letting go. When listening to music, you can tap the button on the right earphone to play/pause music. Double tap the button on the right earphone to skip to the next track, or triple press the button on the right earphone to go to the previous song. When receiving a call, you can touch the button on the left earphone to answer/hang up. Touch the same button for a few seconds to reject the call. Double tapping the left button when not on a call will activate the voice assistant (or Siri, if enabled on the iPhone). A single tap of the left button when not on a call is supposed to activate the Funcl AI Assistant, however, this function didn’t work at the time of this review. The AI Assistant requires using the Funcl App, available both on Android and iOS. I installed the app, but couldn’t get AI functions to work on either my Galaxy S9 Plus or iPhone XS Max. Funcl did say that they are working on some features on the app, which they expect to be completed in December, and I will update this review after the app has been finalized. Also, those who have used the Apple AirPods should be aware that the Funcl AI doesn’t have functionality similar to the Apple W1 chip, such as playing music as soon as you put them in your ears or pausing music when you take them out of your ears. It is possible that some of these features may be added later because this earphone uses the Qualcomm Smart Audio Chip. Finally, you cannot connect two devices simultaneously, something that my Jaybird Freedom earphones were able to do. It is a little inconvenient when you use two devices, because you must disconnect it from one device and connect it to another device, although, this is not really a deal breaker, and many earphones especially in this price range do not support this feature. I have tested these earphones for calls and it works well. When getting a call, you will hear the ringtone through the earphones, and you can press the button on the left earphone to accept the call. Press the same button again to hang up. If you have music playing and you receive a call, then the music will pause, and you will hear the ringtone. The music will continue again once you end the call. When I first used these, I thought WOW! These sound really good! I was very impressed. I listened to various types of music, and everything sounded great. They were great when I was watching a movie as well. They definitely sound better than my Jaybird Freedoms. In fact, they sound similar to my old Jaybird X2, if not better, which is pretty astounding, considering that these cost so much less. The Funcl AI advertise a low latency (60ms). I have used them to watch a movie, play games, and the video/audio sync is spot on. The range of volume is very good, from very low to very loud. The nice thing about these are that they are totally wireless, meaning no cord noise! I did a run, and these did not come out of my ears. Please note that they are partially noise isolating, so please be careful if you plan to use these when jogging on the street. These are rated IPX5, which means that these earphones have protection from water projected from a nozzle. This should be adequate for most people when exercising. 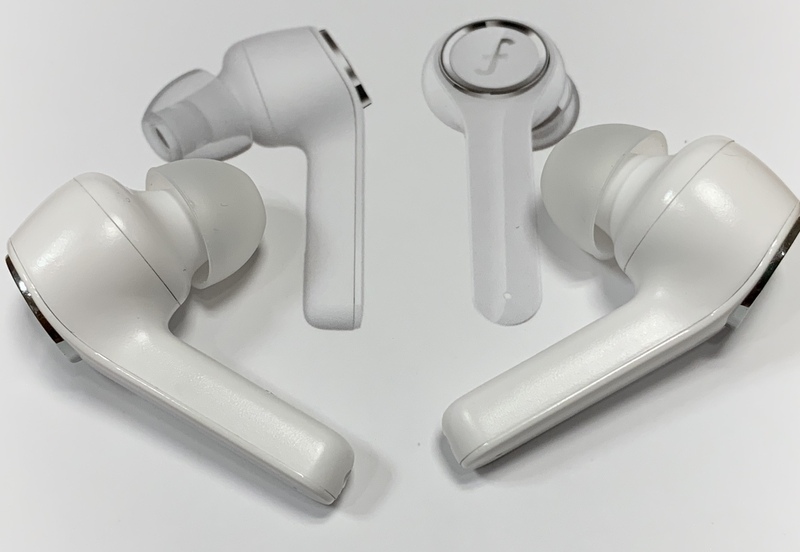 Whether you are looking for a lower priced alternative to the AirPods, or you are looking for a pair of totally wireless earphones to replace your lost AirPods, then look no further than the Funcl AI for half a Benjamin! These provide great quality for the budget-oriented shopper! If you are looking to spend even less, then consider the Funcl W1, true wireless earphones for $19. Wow! Following is the price options on the Indiegogo page.